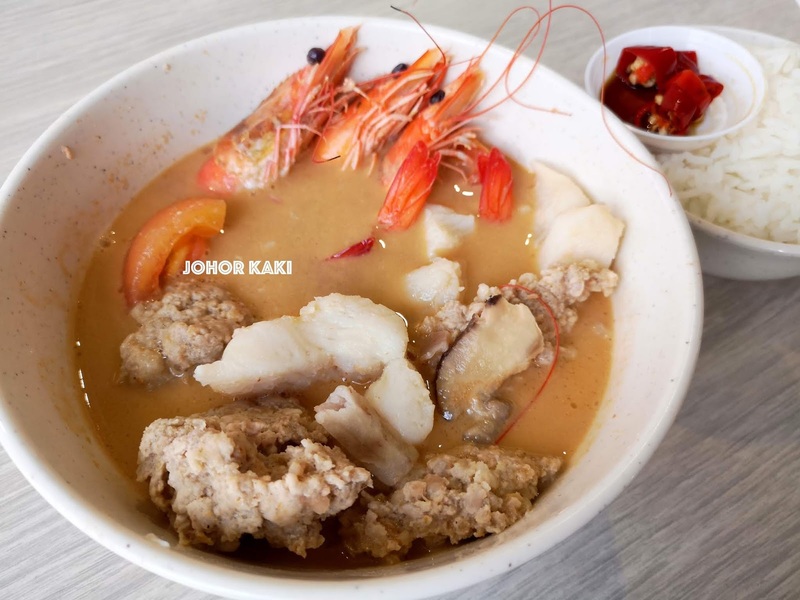 Yan Ji Seafood Soup 炎记海鲜汤 started in Woodlands Hawker Centre in 1981 - this "Woodlands seafood soup" is now a nation wide brand with 5 outlets (and several copycats) across the island. 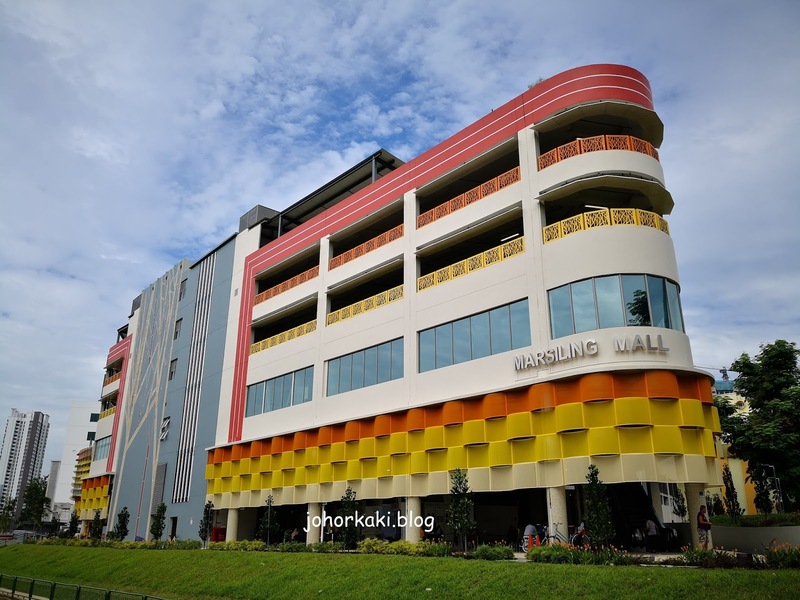 Yan Ji moved to Marsiling Mall nearly 2 years ago as the old Woodlands HC was demolished. 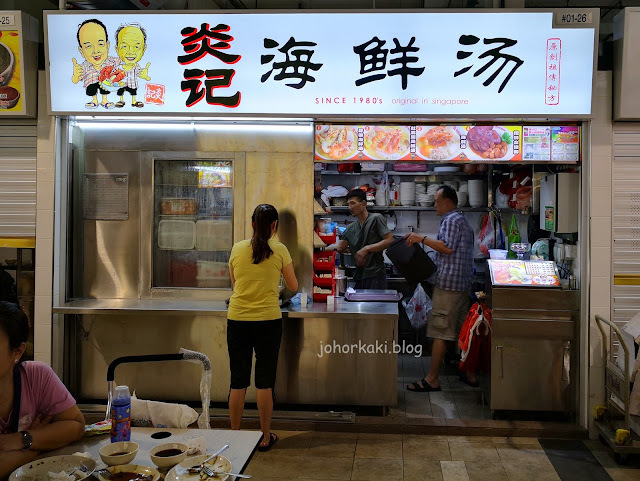 This was my first visit since Yan Ji moved to the new hawker centre. 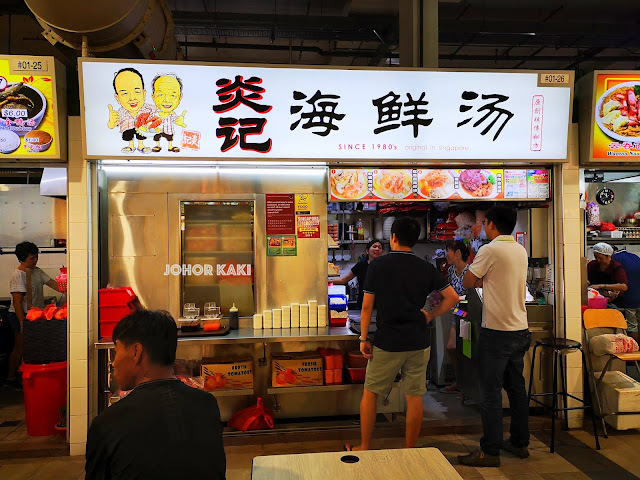 Yan Ji is located in one of the inside rows in Marsiling Mall. 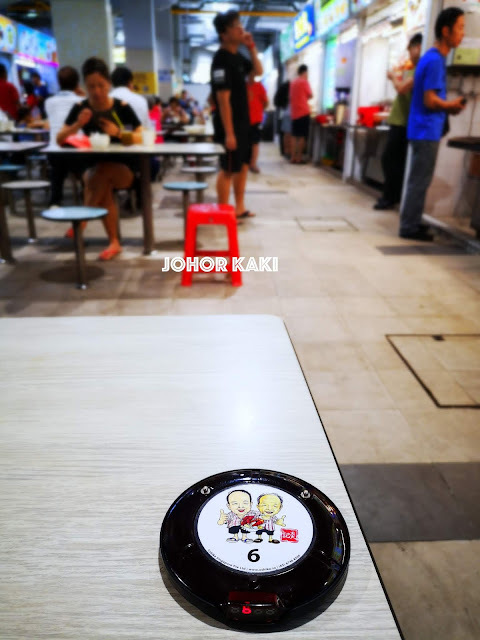 You won't see a long queue at Yan Ji Seafood Soup because after you made your order and paid your bill, they will issue you a pager. 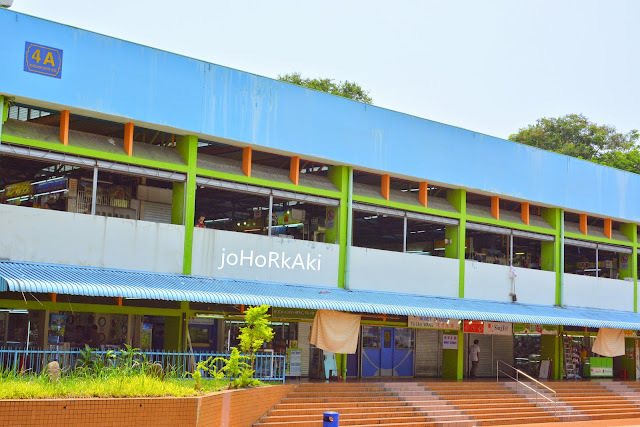 Go and find a table at the hawker centre. 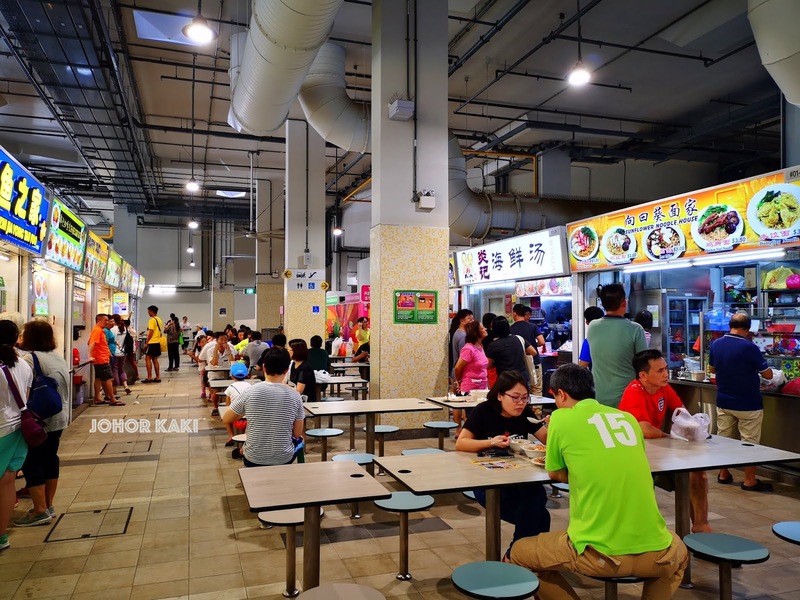 When the pager buzzes, go back to the stall to collect your food. I waited about 30 minutes before the pager buzzed. I ordered the same seafood soup and rice as during my first visit in Woodlands Hawker Centre nearly 4 years ago. 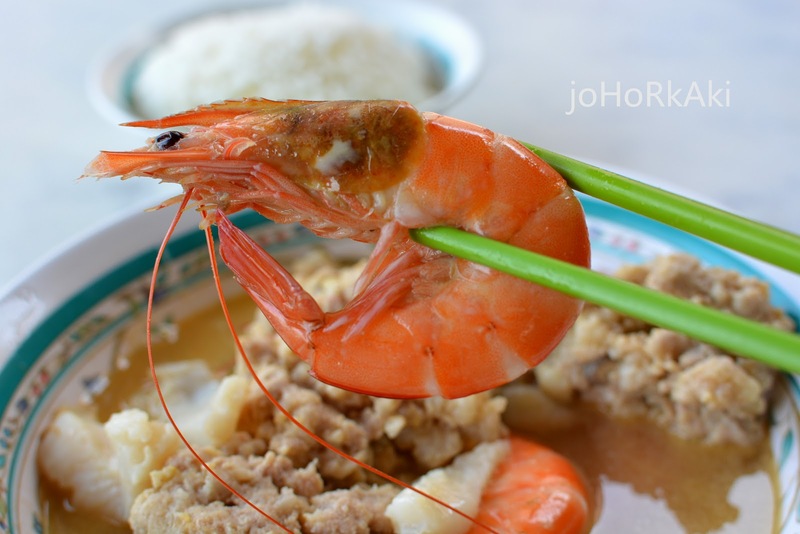 This came to S$9 (with rice) - I was pleasantly surprised that it was just slightly higher than $8 from 4 years ago. The soup filled up to ⅔ of the bowl (which is the norm at Yan Ji. 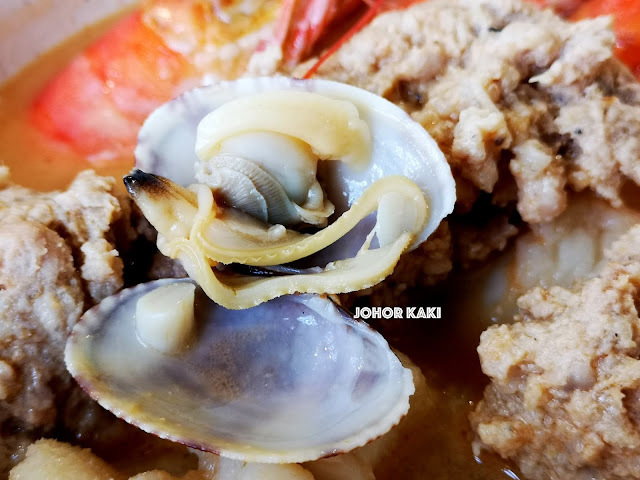 Like the bak kut teh stock in Klang where it is also served half full only, Yan Ji's "soup" is really a seafood stock). There were 4 or 5 pieces of this minced pork big and small. 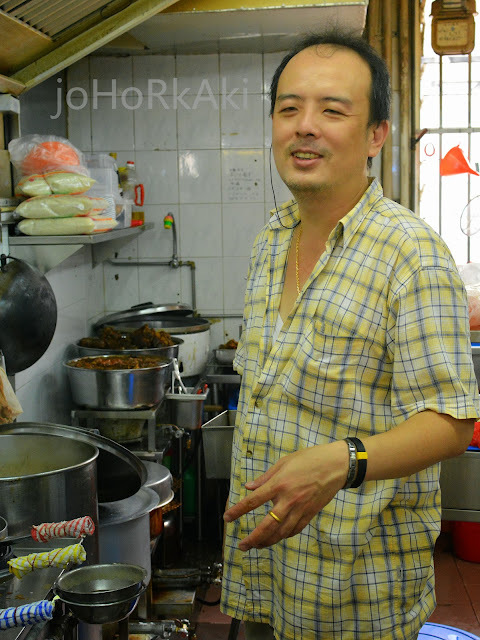 A lot of the sweetness and savoury flavour in the dish came from this minced pork. 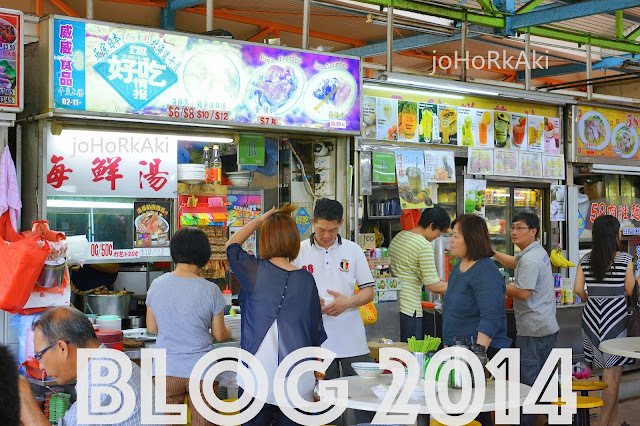 This minced pork "cake" reminded me of the steamed minced pork dish, but there was more to it. There were bits of soft crunchy mushrooms in the minced pork "cake". There were also powdered fried dried sole fish (ti poh), fish paste and eggs which bind everything together. 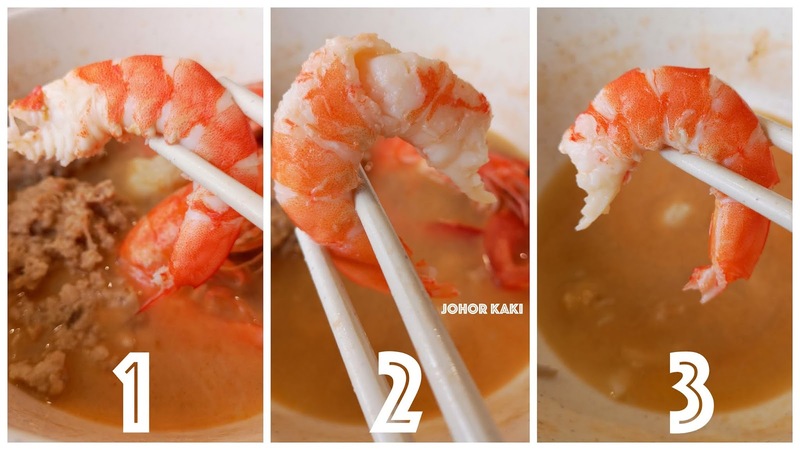 There were 3 good size prawns with shell on. 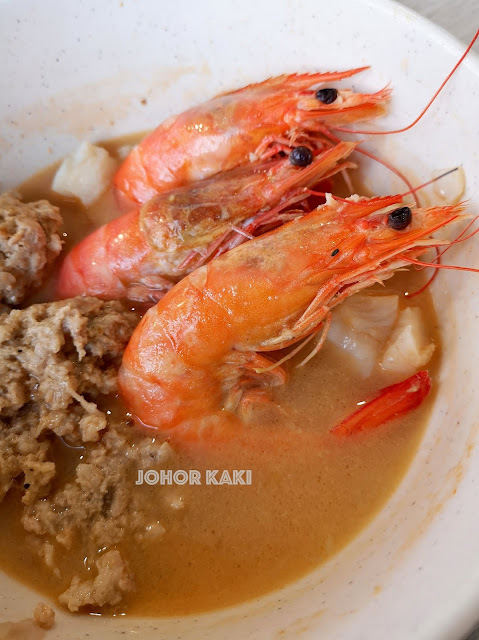 The prawns were nicely tender though they didn't have the firm crunch and sweetness of ocean fresh prawns. One la la clam. 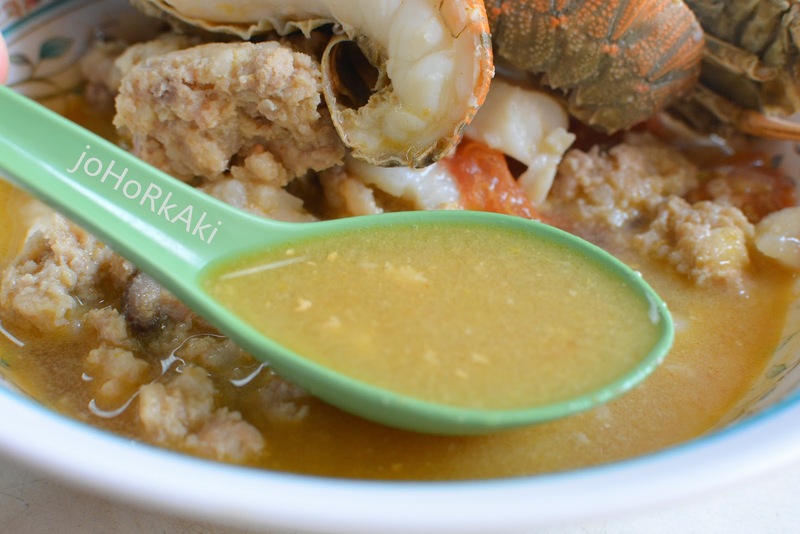 Most of its flavour was already surrendered to the soup (to make it sweeter). 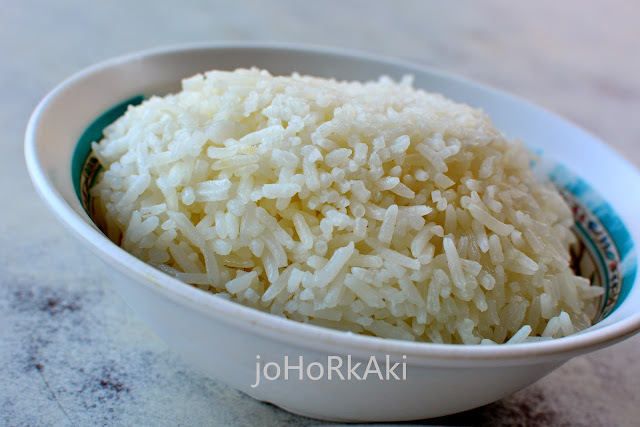 The rice was good - clean tasting with just the right tender firmness and moistness. 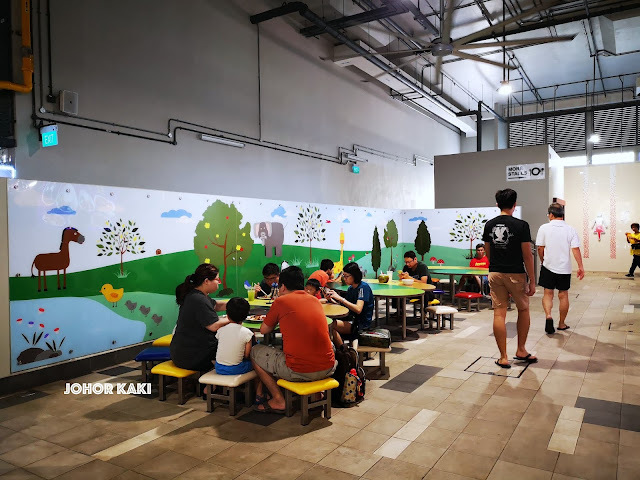 The children's section is a good idea to nurture the next generation of hawker centre customers because only when there are customers will there be hawkers and hawker centres. 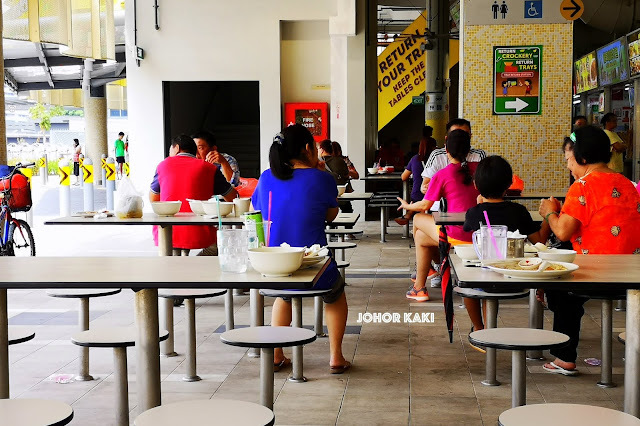 Hawker centres in Singapore have different arrangements to incentivise customers to deliver the trays to the designated washing points. 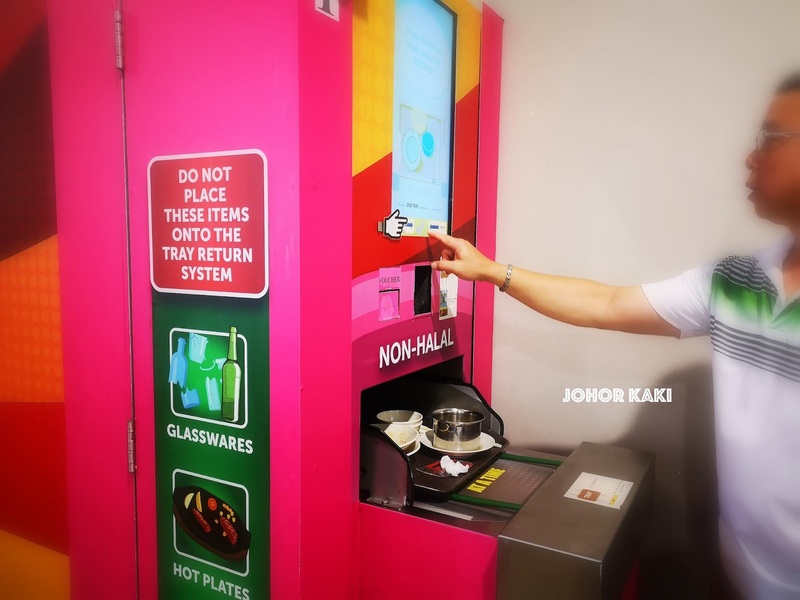 At Marsiling Mall, customers pay an additional 50 cents to use a tray to carry their food from the stall to their table. When customers deliver their tray to the washing point, they will be reimbursed 50 cents. 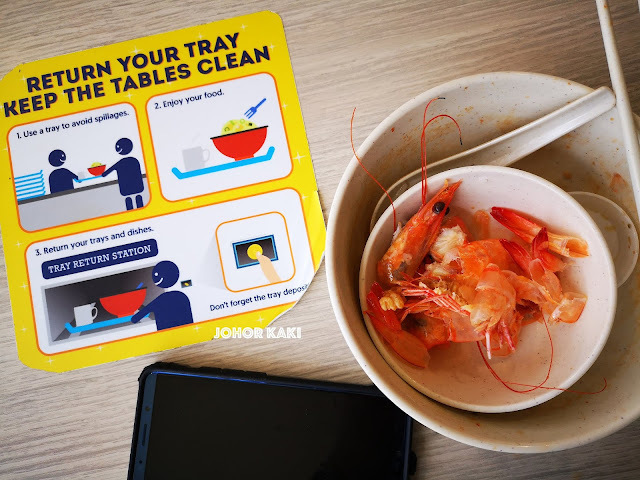 Pro Tip: Whether you take a tray or not, please bring your used plates, bowls and cutlery to the washing point. 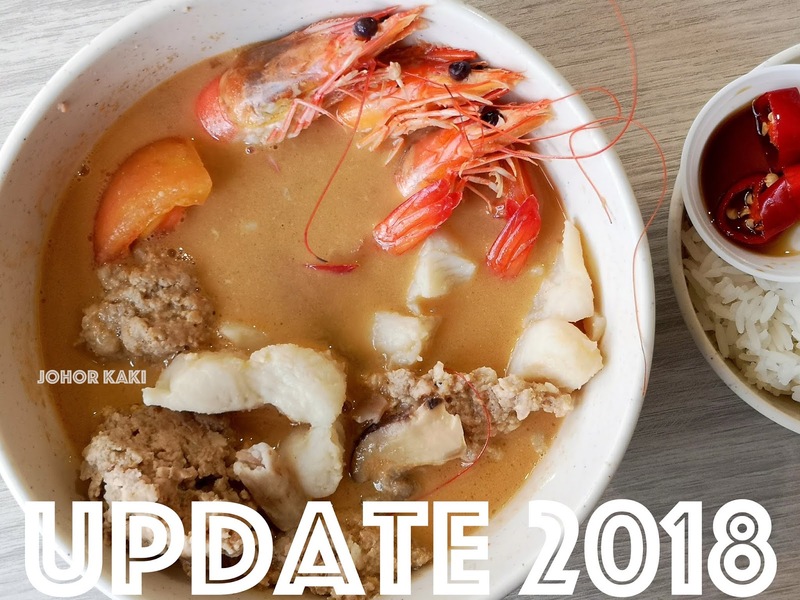 👉 炎记 Yan Ji's unique seafood soup created in Singapore is still the best soup that I know of in a Singapore hawker centre. 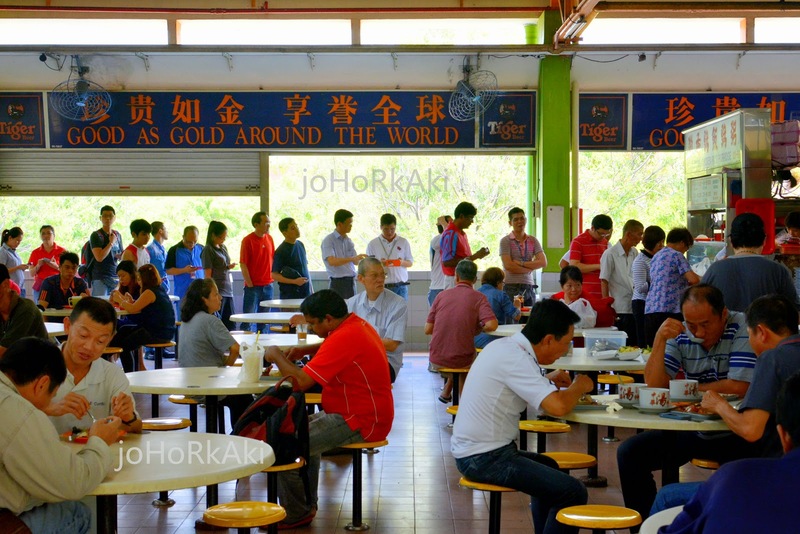 The queues are long at 炎记 especially during lunch when workers from the industrial areas in Woodlands, Kranji and Admiralty descend on this popular food centre in Singapore's far north. Yan Ji 炎记 is now helmed by Ah Whee, the second generation owner and has just opened a branch stall at nearby Marsiling Lane Blk 19. Initially, I was a little surprised annoyed when told that prices start at SGD8.00, which is not the norm at suburban Singapore hawker centres. 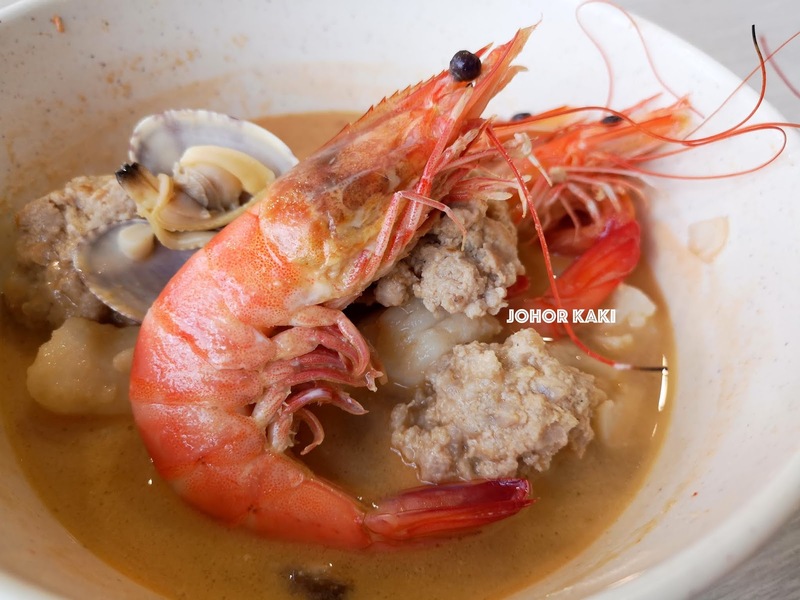 But, when the SGD8 bowl of seafood soup arrived, I immediately understood why. 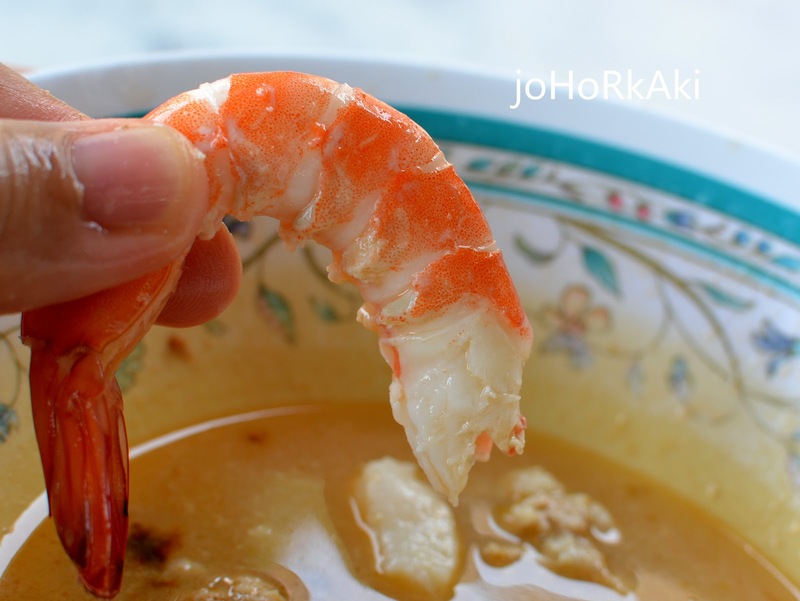 There were 3 of these very fresh, good sized prawns in the broth. The shells fitted the firm meaty prawns snugly but peeled off easily as the prawns were very fresh and cooked just right. There were several big pieces of this minced pork and mushroom "biscuit" 肉餅. Tender, mildly savoury and naturally sweet, with bits of visible fat. Very tasty. Likable and filling. 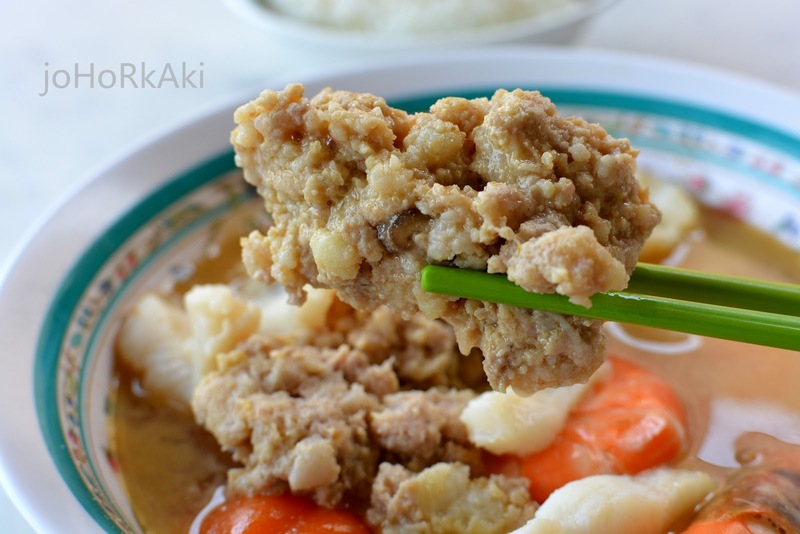 There were several pieces of this white dory fish meat which were tender and naturally sweet. 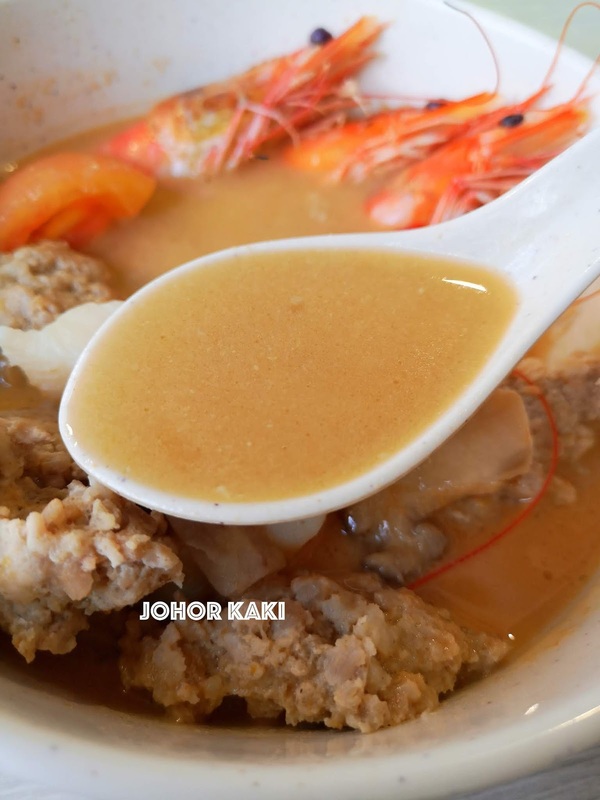 The broth was smooth, full bodied, rich, deep, cloudy, with nicely balanced layers of savouriness and sweetness. A key ingredient in Yan Ji's seafood broth is sun dried Hokkaido scallops. The broth was very drinkable and as the last two drops slide down my throat, I yearned for more. Many people must be saying in their minds, "May I have some more soup, pleaseee". 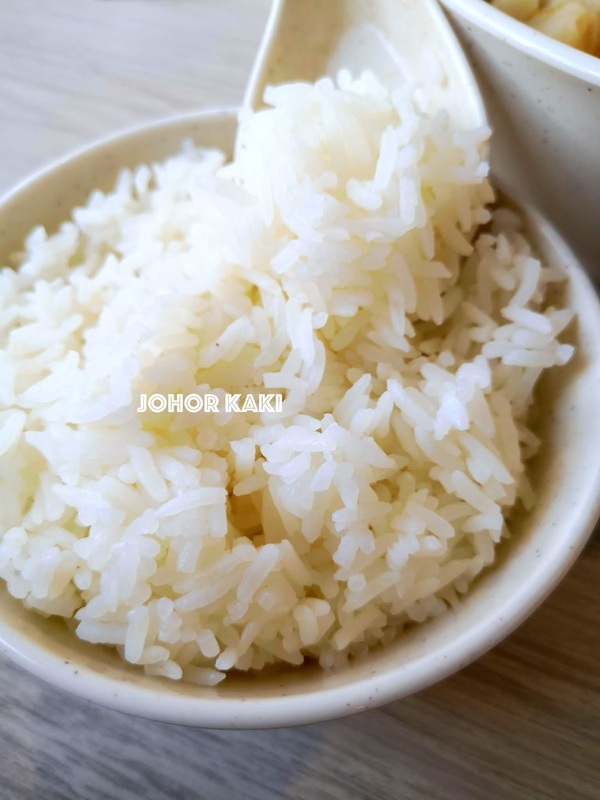 A minor but important detail - the rice. 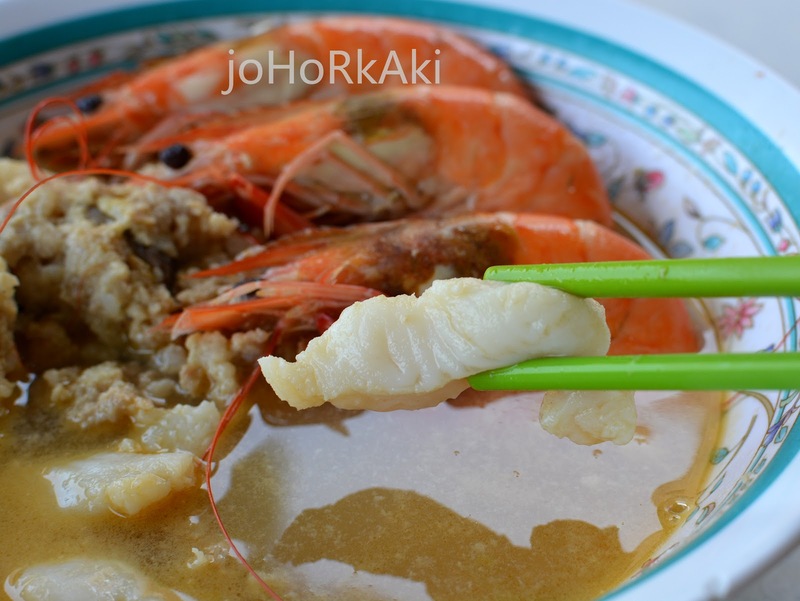 The good quality grains were nicely cooked - the right texture and moistness added to the enjoyment of the seafood soup. 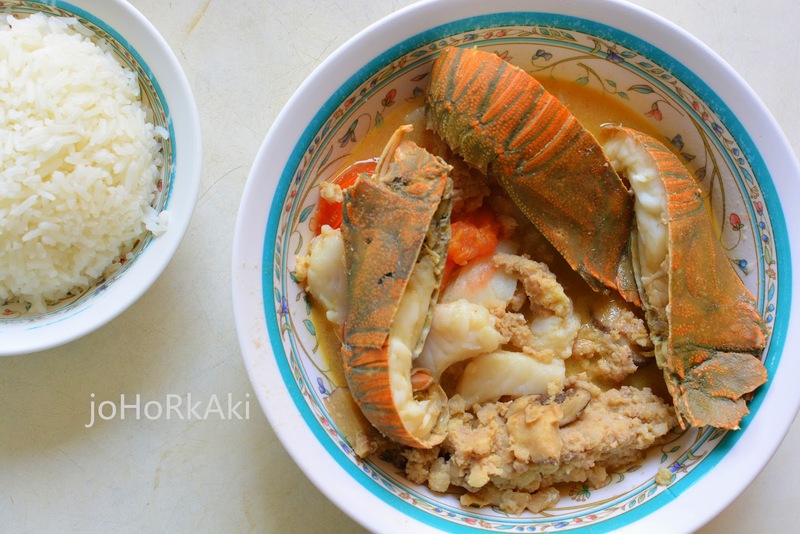 I like crayfish as it is meaty and more tender than prawns. 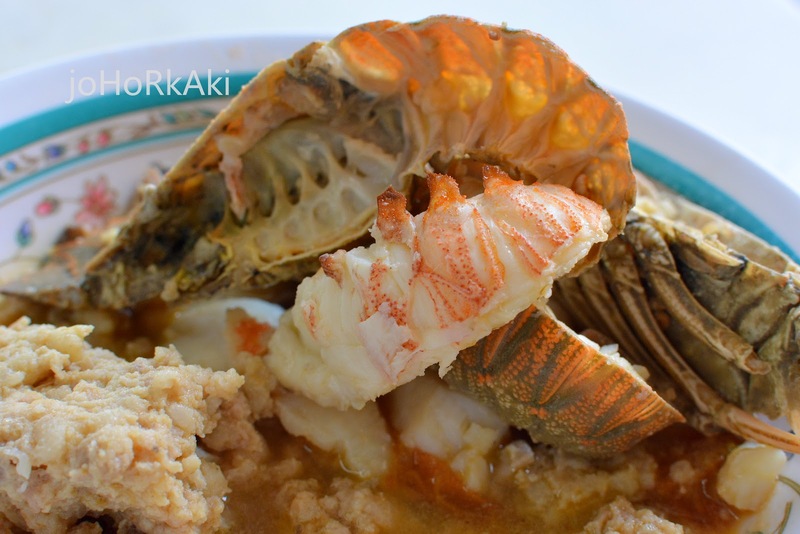 The flavour is also slightly different from prawns, which makes crayfish an interesting alternative, when it is available. 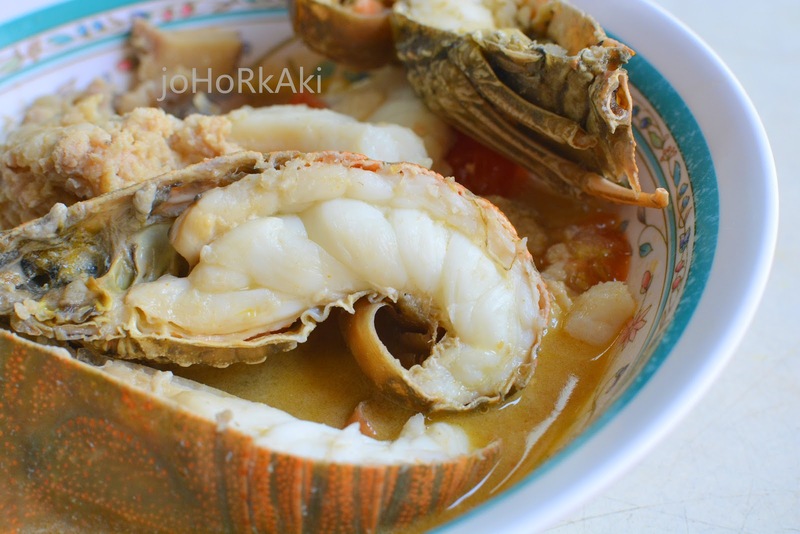 The seafood broth with crayfish had a more robust crustacean flavour than the one with the prawns. 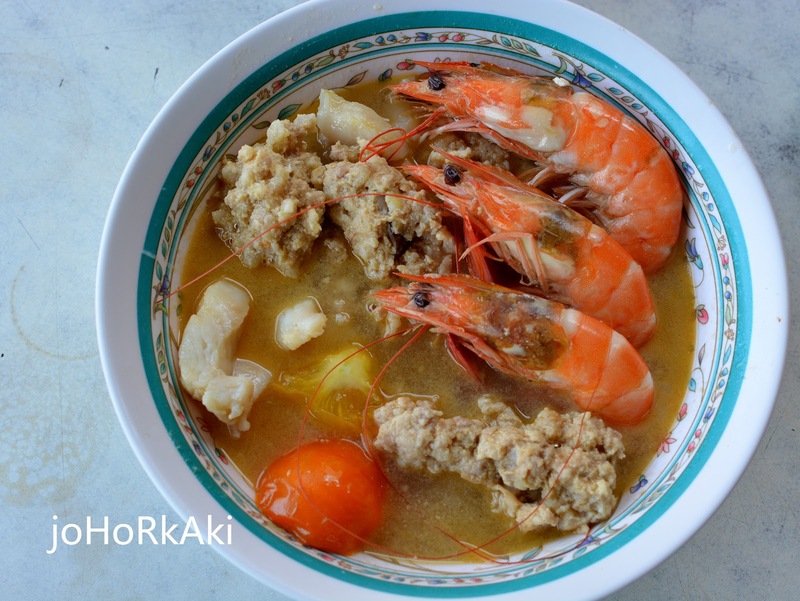 Personally, as I like cleaner tasting broth, I prefer the one with the prawns (which I had yesterday). I suspect that the broth with just fish may be the one that would appeal to me most, and I shall try that at the next visit. I was alone and was joined at the table by one of the kopi (coffee) stall owners. Woodlands is one of the last places in Singapore where you can still start a conversation, by smiling, "Hello, I have not seen you here before..."
The smile was reciprocated, and then, he sat down and we chatted over kopi for 30 minutes :-D Learnt quite a bit about this food centre by chatting with the kopi stall boss. Did I hear you say Woodlands is too far? 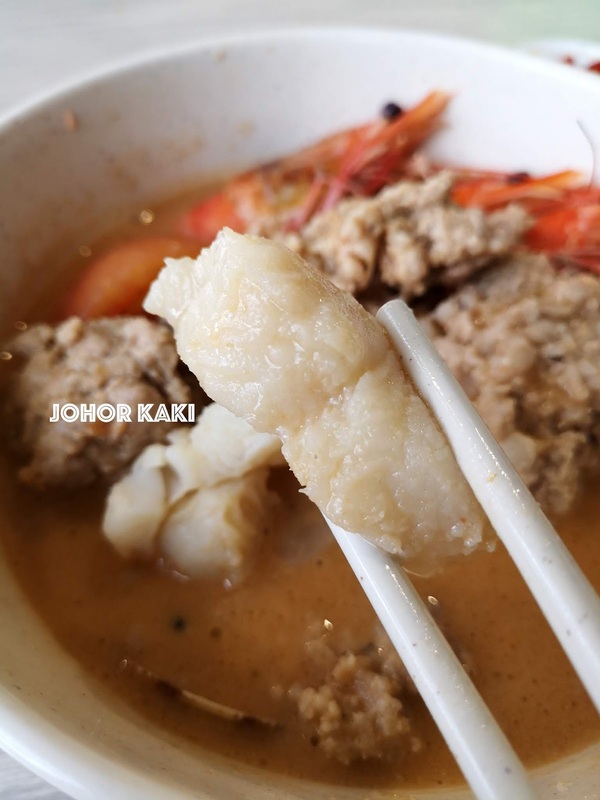 Yan Ji 炎记 has fans from across the Causeway in Johor Bahru who braved the immigration jam, drive over to enjoy 炎记 seafood soup and then return back to JB. Woodlands Centre food centre is on the second floor of Blk 4A. 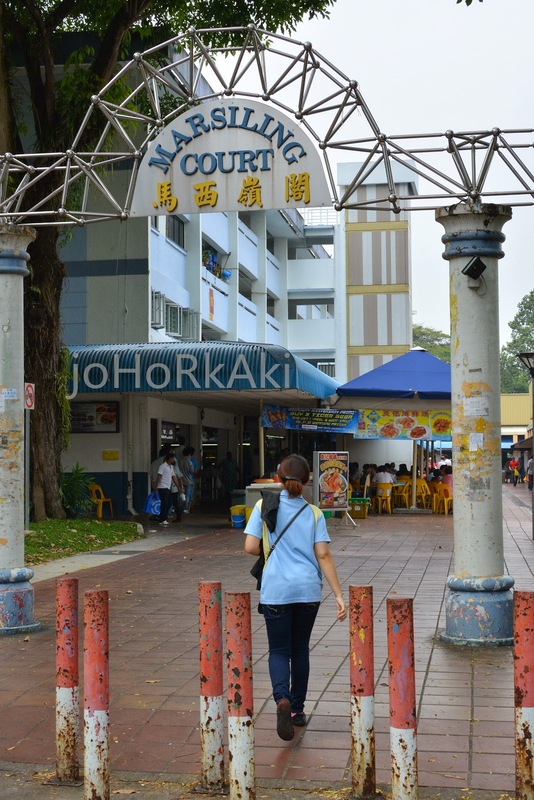 Plenty of car parking next to the food centre. 炎记 just opened a branch at Broadway Coffee Shop (Marsiling Lane, Blk 19), just beside Marsiling Market which is just 1 bus stop from their old Woodlands Centre stall. Ah Whee shuttles between the two stalls, personally overseeing the operations at both ends. 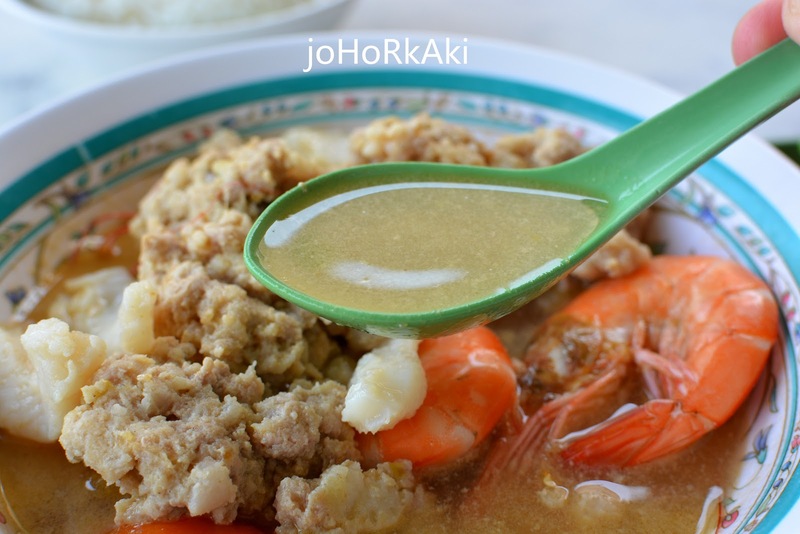 I've always liked their seafood soup. The 猪脚 pig trotter is also one of the better ones around. OK I shall order that at my next visit. Thank you Hartmann. Overall nice, but don't like the dory fist. i prefer they use batang fish or better fish. 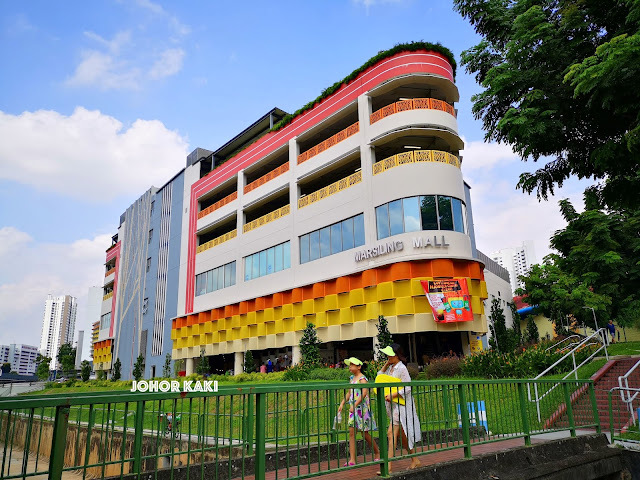 Thanks Joseph for your comment. It reminded me that they have a grouper fish version at added cost. I shall add that in. Appreciate much. 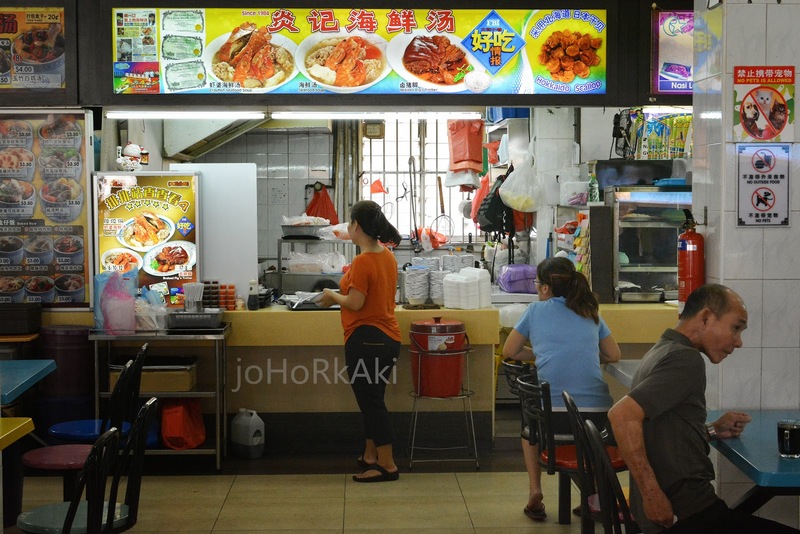 Too expensive for that type of dory fish. 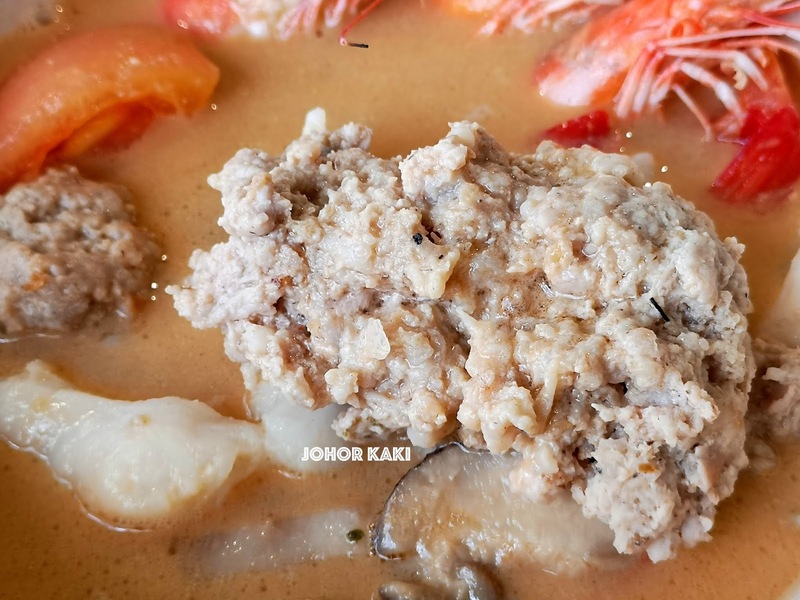 Stingy in soup.once i dun want upgrade to grouper fillet ending up with a bowl of boiled dory with less than half a bowl of soup. Charge 7 or 8 bucks. Thats my last time.